Tehachapi City Councilman Phil Smith was one of the celebrity wine pourers at last year’s Valentines Wine Walk. This year, local wineries will be pouring at The Tehachapi Depot. The 12th Annual Chocolate and Wine Walk in downtown Tehachapi will be held on Feb. 9 this year. Join the friendly faces that go from business to business along the downtown streets to sample tasty wines, paired with delicious chocolates, handmade by local resident Linda Pettitt of Linda’s Cakes and Things. Not only a fun social event, you have the opportunity to shop with your Valentine and purchase the perfect Valentine’s gift from the best stores in town. The event offers an opportunity to sample wines from local vineyards. Dorner Family Vineyard, Triassic Vineyards, The Tehachapi Wine and Cattle Company, Rancho de los Viajeros Vineyard, and Stray Leaves Vineyard will all pour their wines. Other host businesses will have wine from other vineyards. Tickets are available at The Loop Newspaper, Bliss Interiors, The Dressing Room, Dahlia’s Boutique and the Tehachapi Visitors Center, and only cash and checks will be accepted. Tickets are available by credit card online at mainstreettehachapi.org by clicking on the link to purchase tickets. Tickets are $40 each in advance and $45 on the day of the event. This is a rain or shine event. All ticket holders will begin at the Tehachapi Depot on Tehachapi Boulevard, where you will pick up your souvenir glass with this year’s Valentines logo on it, along with 10 tasting tickets which can be redeemed at any of the hosting businesses and at the Depot where the local vineyards will be pouring. 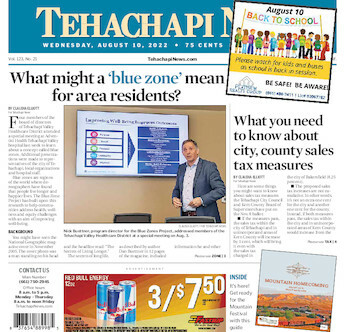 Sponsors include the five local vineyards, The Loop Newspaper, Mercury Graphics, Linda’s Cakes and Things, Tehachapi Visitors Center, Linda and Stacy at Re/Max, A & M Home Inspections, and Big Papa’s Restaurant, which will be hosting an after party in the saloon at the restaurant on Tehachapi Boulevard. This year, Kelcy’s Restaurant will be one of the tasting hosts. In addition, the restaurant will be open on Saturday from 4 to 10 p.m. and Sunday from 8 a.m. to 2 p.m., serving a menu of homemade soups, a casserole and burgers plus more. Be sure to visit the newest hosts of the wine walk in west downtown, Alligator Rose, Mill Street Kitchen, and Wizard of Happy Paws. For more information on Valentines Chocolate and Wine Walk, please leave a message for Main Street at 822-6519 and your call will be returned. Charles White is a Tehachapi resident who volunteers with many local organizations to preserve and improve the quality of life in Tehachapi.